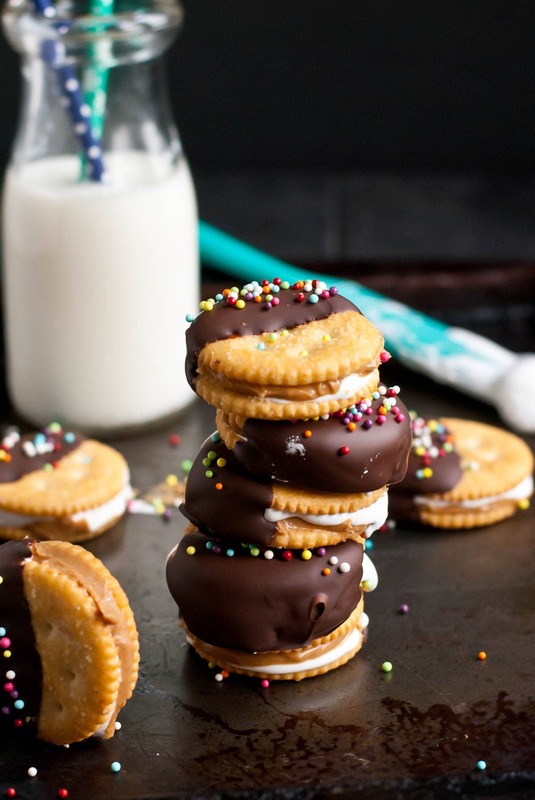 These four ingredient Chocolate Dipped Fluffernutter Ritz Cookies are the perfect easy party bite! Well, friends, the countdown to Christmas is on. I’m rocking the Pandora Christmas station pretty much 24/7 these days, and for the most part, I’m loving every minute of it. All my old favorites are cycling through– The Most Wonderful Time of the Year, Have Yourself a Merry Little Christmas, and All I Want for Christmas is You (<<<<Just kidding, that song is awful). Throw in a little Rockin’ Around The Christmas Tree (Am I the only one who can only think of Home Alone when this song plays?) and Mary Did You Know (Pentatonix version, of course. Chills.every.time), and my Christmas spirit is off the chain. And then there’s Santa Baby. You know the one. Grown woman sing/talks in a “cute” semi-baby voice and asks Santa to bring her all kinds of goodies. This isn’t your average Christmas list. This woman wants a car, a yacht, a couple checks, some Christmas decorations, a duplex, and, last but not least, a ring. As I was listening and singing along for about the 20th time this year, I had a revelation. This girl is a brat. It was a reality check for me. That song is the exact opposite of what I want this season to be about. It’s easy to fill this month with shopping and parties and decorations and wrapping and ALL THE PRESENTS. I love all of those things, I really do, but sometimes I long for something simpler. I long for quiet, stillness, a window of time to reflect on the beauty and wonder of a King born in a dirty manger stall, a God who came close. This season, I want to practice gratefulness. I want to take time to love the people in my life well–the ones who are celebrating and the ones who are hurting. I want to sit at the table together and eat and laugh, stay up too late and leave the dishes in the sink until morning. I want to turn off my phone and hold my sweet baby and gaze at a twinkling tree. I want to make space–for celebration, for stillness, for gathering and reflecting. 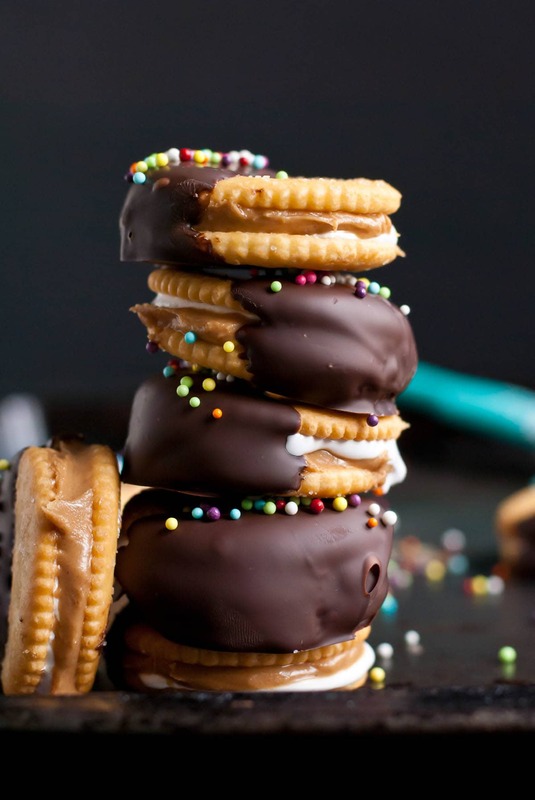 In the interest of creating space, I bring you these Chocolate Dipped Fluffernutter Ritz Cookies. My sister in law always makes chocolate covered peanut butter ritz sandwiches for the holidays, and they’re always a favorite. 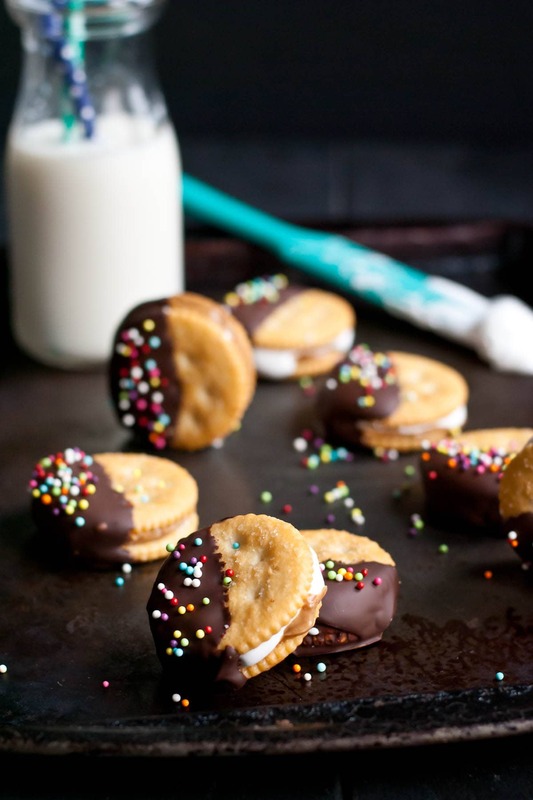 These are the same idea, but with the added goodness of marshmallow fluff and semi sweet chocolate. 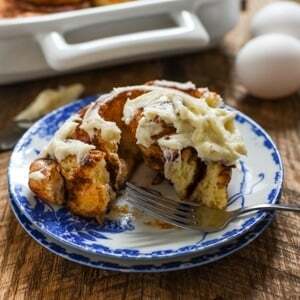 This is the perfect recipe to make with the kids, your best friend, your mom, your neighbor. With only four ingredients and zero bake time, this recipe is all about keeping it simple. Gather up a buddy or three and enjoy an afternoon of story telling, chocolate licking, and general mess making. I served these at a Girl’s Night party, and they went over like gang busters. For once, I didn’t stress about having a spotless house or four course meal. 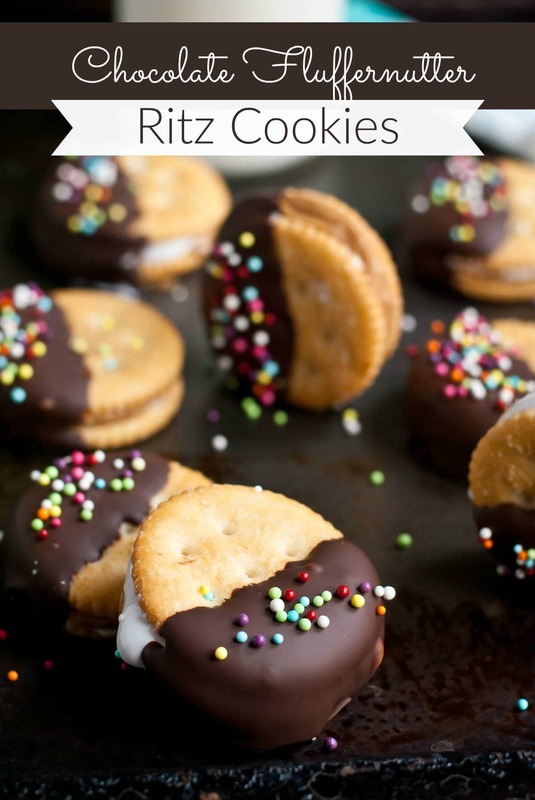 I set out a simple grilled cheese bar and some of these irresistible Ritz cookies, and then thoroughly enjoyed myself and the company of dear friends. That’s my wish for this Christmas. Less stress, more sprinkles. Less stuff, more people. Less perfection, more grace. Less time consuming decorated cookies, more sprinkles. Spread half of the Ritz crackers with peanut butter (about a teaspoon each). Spread the other half with the marshmallow creme. The marshmallow creme will be very sticky and hard to spread. Just place a blob in the middle. It will spread out when you sandwich them together! 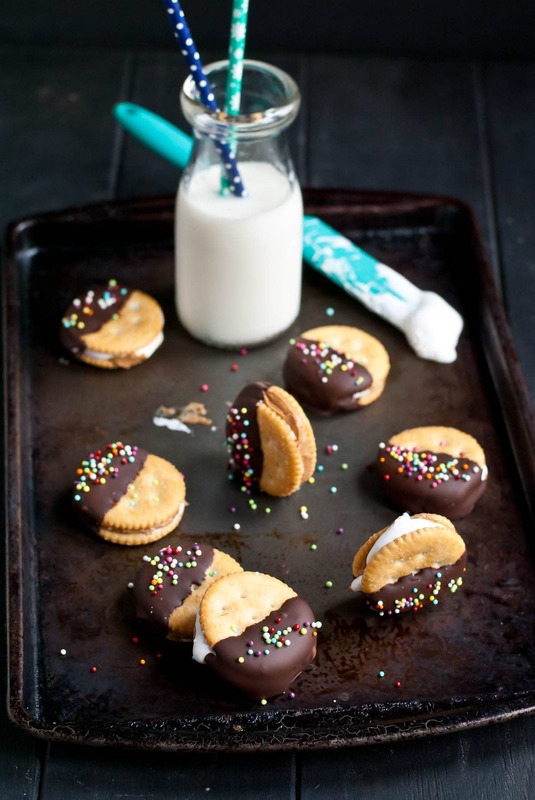 Sandwich the peanut butter and marshmallow crackers together and place them on a parchment lined baking sheet. 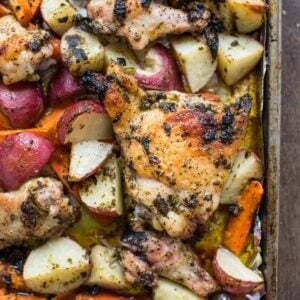 Place the baking sheet in the freezer for about 30 minutes. In the meantime, place the chocolate in a double boiler or microwave safe container and melt until smooth. Remove the cookies from the freezer and dip them halfway in the chocolate. Sprinkle with sprinkles if desired. Lay them back on the baking sheet and allow to dry. Store the crackers in an airtight container, separated by parchment paper, in the fridge for up to 5 days. Serve cold or at room temperature. I sadly am lacking a bit on the Christmas cheer just because I’m still unpacking from the move (don’t worry still in Cbus just moved from Gahanna to Clintonville) and haven’t had the time to decorate and haven’t listened to any Christmas music cause it feels weird when I’m painting the walls or unpacking. Although I guess unpacking is kind of like opening presents. And painting is somehow related to wrapping presents? I’m not sure. 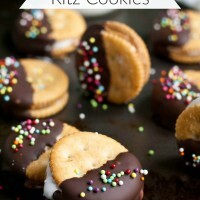 But regardless I LOVE these ritz cookies and that you added fluff to them! You know, I’ve always hated the song Santa Baby. It annoys me whenever I hear it. I have choice words about that song, but suffice to say that it’s far from my idea of what Christmas is supposed to be like. Anyhow, these cookies…. I love the simplicity and the fact that you used semi-sweet chocolate for it. First of all, I NEED to make these this holiday season. Damn, they look good. And your photos are gorgeous, Courtney. Most importantly, I fully agree with your sentiments in this post. I love how eloquent and self-reflective you are. I’ve been feeling this way about Christmas my entire adult life. When I was a kid and in high school, it was all about the presents. But now, I cherish this season because I get to enjoy time with my family and friends, and I’m so thankful and appreciative of everything I have in my life. I’m an extremely lucky person and I know it. And seriously, nothing sounds better at this time of year than to slow down, fully live in each moment, sit in front of my tree with its lights twinkling, reading a good book or watching White Christmas for the 1000th time, with a hot mug of tea and my little Abby on my lap. Heaven! Merry Christmas to you and your beautiful family, my friend. Oh you’ve just described my perfect Christmas evening! Maybe with a side of Christmas cookies and egg nog. 🙂 I hope you do try these out. They’re one of my favorite things I’ve made all year! I loovveee these kinds of cookies! My aunt always makes peanut butter ones dipped in white chocolate. The fluffernutter ones look sooo good! Great job, pinned! White chocolate would be so lovely too. I love how simple these are to make but still SO delicious. PS I feel you on Santa Baby. I used to work retail and they would play a Britney Spears version every hour. It drove me absolutely nuts!! I’m mad just thinking about it now, haha.